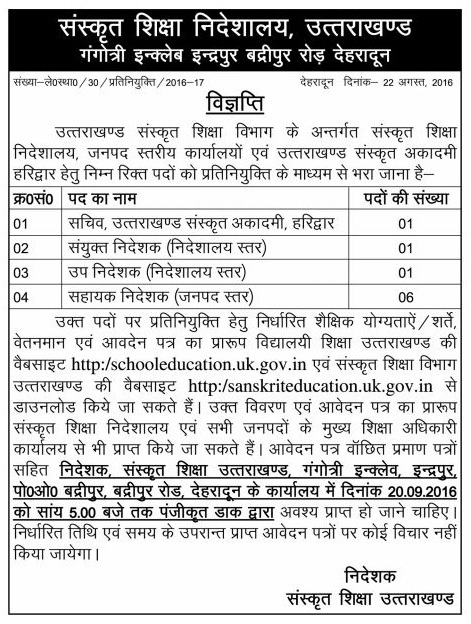 Directorate of Sanskrit Education Uttarakhand, Dehradun has released notification for the recruitment of Joint Director, Assistant Director, Deputy Director for District-level office and Uttarakhand Sanskrit Academy. Interested candidates may apply on brfore 20 July 2017. 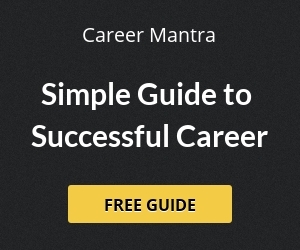 Selection of candidates will based on their performance in written exam and interview. Interested candidates may download the application form from the official website www.sanskriteducation.uk.gov.in and send it along with all testinomial to the address given below. The application form should be reached on before 20 July 2017. Last Date of Submit Application Form : 20 July 2017. Help us to improve this article/job posting "Director & Assistant Recruitment in Uttarakhand Sanskrit Academy". We would be glad if you can comment below and provide your valuable suggestions and feedback. If this page have any wrong information/list or out of context content, then you can report us as well. As per your advertisement for Different posts(J.D., Dy.Dir.,Asst Dir.) on 30 June 2017 I have some quarries. 1-What B.Ed. in Sanskrit means. 2-Requirement of MINIMUM EDUCATIONAL QUALIFICATIONS is not given in advertisement. So what are minimum qualifications for different posts. 3-Will the educational merit be counted. 4-The nature of written exam is not given. ( will it be subjective / general awareness based / reasoning based., maximum marks etc. 5- The information about the date of exam.